"I am so used to hearing about innovation in journalism that when I first heard about the Innovation Journalism program at Stanford, I assumed that's what it focused on. Not exactly. The VINNOVA-Stanford Research Center of Innovation Journalism actually focused on helping journalists cover the field of innovation. David Nordfors, a Swedish punk rocker-turned-molecular-physicist-turned-journalist, found that journalists were stuck in silos of "business journalism" and "technology journalism" and couldn't see the big picture of innovation. 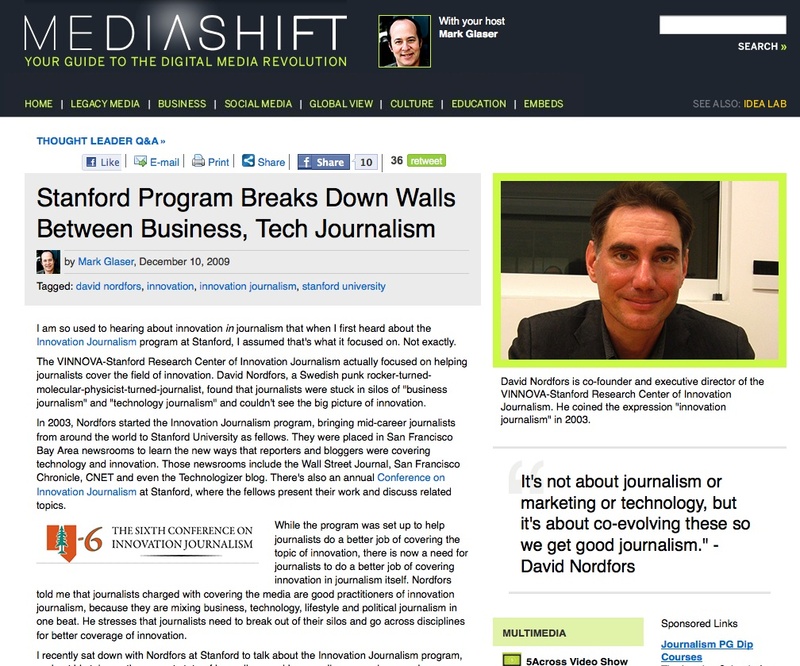 In 2003, Nordfors started the Innovation Journalism program, bringing mid-career journalists from around the world to Stanford University as fellows. They were placed in San Francisco Bay Area newsrooms to learn the new ways that reporters and bloggers were covering technology and innovation. Those newsrooms include the Wall Street Journal, San Francisco Chronicle, CNET and even the Technologizer blog. There's also an annual Conference on Innovation Journalism at Stanford, where the fellows present their work and discuss related topics. While the program was set up to help journalists do a better job of covering the topic of innovation, there is now a need for journalists to do a better job of covering innovation in journalism itself. Nordfors told me that journalists charged with covering the media are good practitioners of innovation journalism, because they are mixing business, technology, lifestyle and political journalism in one beat. He stresses that journalists need to break out of their silos and go across disciplines for better coverage of innovation. 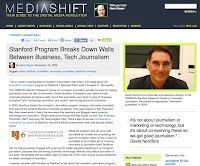 I recently sat down with Nordfors at Stanford to talk about the Innovation Journalism program, and get his take on the current state of journalism, and how media companies -- and even journalism schools -- need to change. The following is an edited transcript of our conversation, including audio and video clips. "